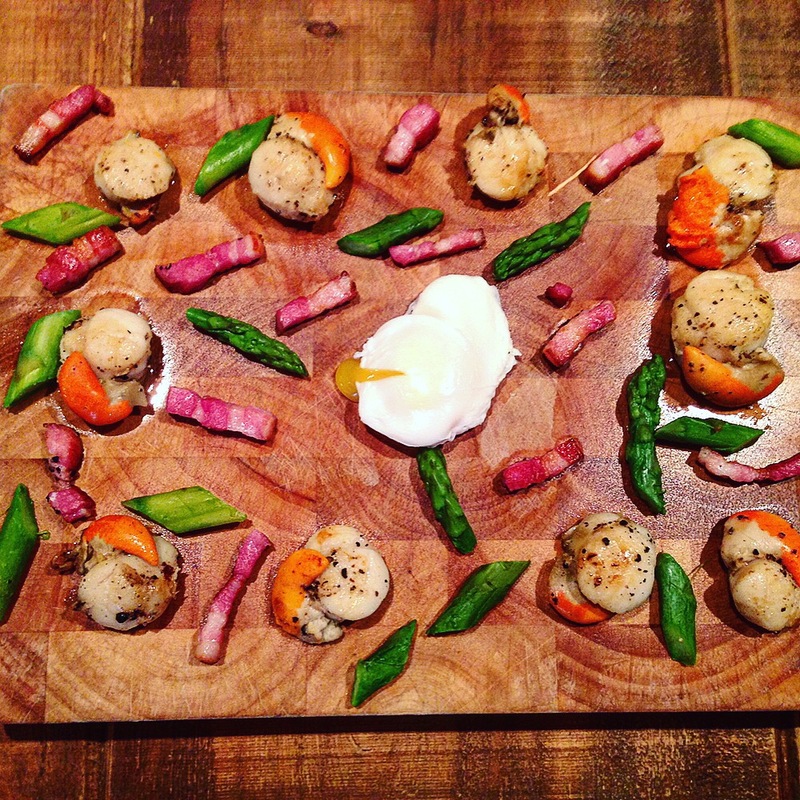 Scallop, Asparagus and Bacon sharing board with Poached dipping Duck Egg. Scallops Bacon and Asparagus are such a great flavour match, salty bacon, seafood and fresh in season Asparagus. Add to that a fresh poached duck egg with salt and pepper to dip them in and you’ve got a nice grand sharing starter. It’s one of those recipes that just came to me one afternoon thinking about food (again). It’s always impressed guests. The other thing is it’s easy as pie to make, I’d suggest doing it by by bit but leaving the scallops and egg till the end. Serves 2 as a large starter or 4 as a small sharing board. Takes around 30 minutes maximum. 10 Large Scallops with or without Roe (I prefer them with Roe). 1. Heat an oven to around 80 degrees Celsius for keeping things warm. 2. Break off the woody ends of the asparagus and chop into chunks then sprinkle over some salt, pepper and paprika. 3. Get a shallow frying pan and melt some butter. Add a little boiling water just to cover the bottom of the pan. 4. Add the Asparagus and cook till they are just soft. Transfer to a plate and keep warm in the oven. 5. Get a frying pan on the heat, add a tiny bit of butter, once its melted add the lardons. 6. Cook till slightly charred and crispy. 7. Take the pan off the heat, put the lardons into the oven with the Asparagus. Keep the bacon fat in the pan for cooking the scallops in. 8. Boil some water, transfer it to a large deep saucepan and let it boil. 9. Sprinkle salt and pepper onto the Scallops on both sides. 10. Heat the bacon fat back up on a high heat in the set aside frying pan and place the scallops in the pan. They will only need a maximum of 1 minute per side so while they are cooking you can poach the duck egg. Just don’t forget to turn them over so you cook both sides, they should have a nice slightly browned colour from the fat when they’re done. 11. Get a whisk and some malt vinegar, drop a drizzle of Vinegar into the boiling water. 12. Crack the Duck egg into a ramekin and sprinkle with salt. 13. Whisk the boiling water round and round until there’s a deep well in the middle and drop in the egg and boil for 1 minute. 14. With a slotted spoon carefully remove the egg from the water and drain off the excess water. 15. Arrange all your ingredients on a large board with the egg in the centre. I really really want to have some of this!